Café, fashion, lifestyle, art gallery. 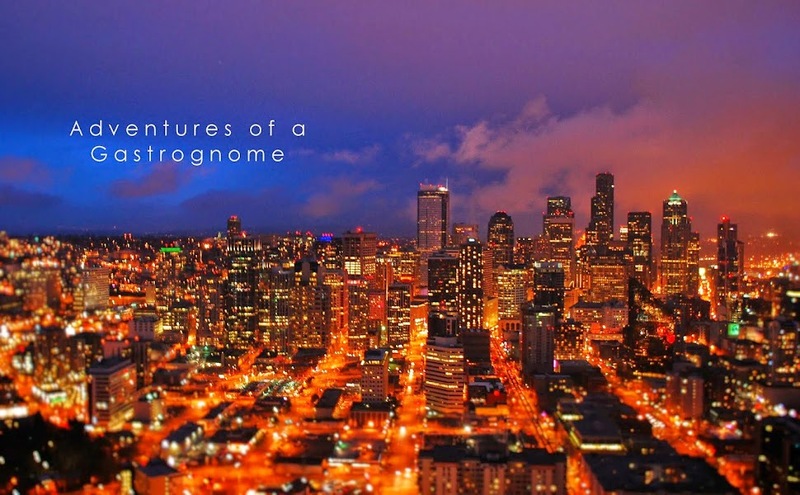 All in one extraordinary space. Before traveling, I always research for the best places to eat. It’s an involuntary act, much like breathing and blinking. 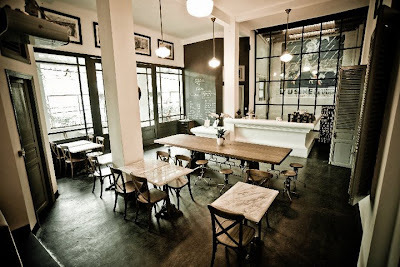 For Ho Chi Minh City, the best dessert place turned out to be L’Usine. The first time I read about L’Usine, people are raving about their cupcakes, the drinks and the stimulating atmosphere. This prompted me to think that L’Usine is just the typical café, a place where I can relax to after doing my sightseeing in the city. And because I have a weakness for cupcakes, this seems the perfect place to chill. After the Saigon Opera House stop, we went to find L’Usine. We found it on the third level of the building in front of Sheraton Hotel. Now, the problem is, how to go up. The building’s ground floor is full of retails shops and there were no signs on where L’Usine is. We went inside a lot of retail shops to find the stairs going up but to no avail. The only place we haven’t entered to is the Art Arcade (with the circular canopy). It turned out to be the entrance hallway to the whole building, which was converted into an art gallery. We went inside and finally, saw a small sign that says to turn right to L’Usine. When we turned right, we saw the stairs leading to the café. Upon reaching the floor, we felt like we were transported to a European country. The café looks amazing! 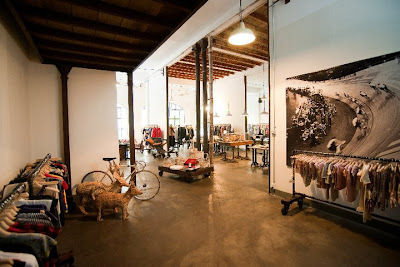 L’Usine is a big spacious shop with big windows and doors, in high ceiling, painted in black and white and with accents of wood and rustic metal. 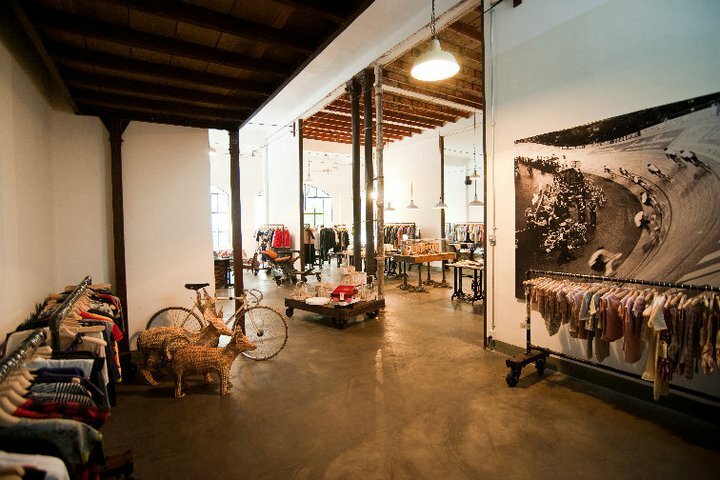 The French Colonial Building that houses L’Usine was previously a French garment factory. We can’t help but roam around the whole space before eating. So we checked out the retail shop first. The shop is a mixture of everything. 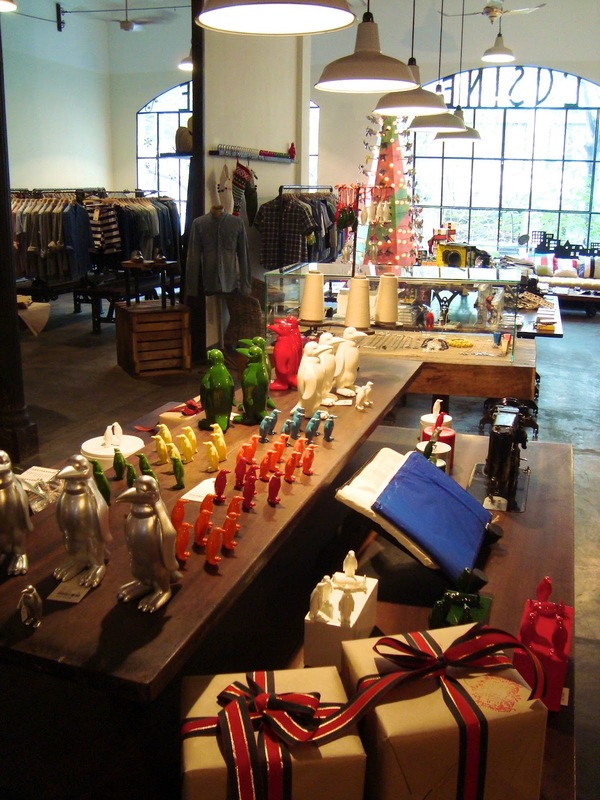 They have decorations, furnitures, clothing, perfumes, shoes, bags, notebooks, cameras and charms. 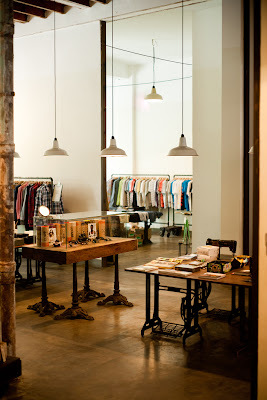 Some of the brands that they have are Baxter of California, Cochine Saigon, Herschel, Lomography, Luxe City Guides, Moleskine, Paper Wings, Rosebud Perfume, Valerie Cordier, Vans, Yumaki. 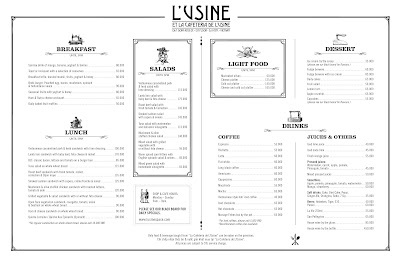 L’Usine is a French bistro which offers sandwiches, salads, cold cuts and even serves breakfast until 5 in the afternoon. It took us a while to order for we can’t seem to choose. Everything sounds delicious. My usual order is a Lemon or a Red Velvet Cupcake. But just to get out of the usual, I ordered the Black and White Cupcake. The frosting is really sweet but combined with the semi-bitter cake, it’s a perfect combination. There’s also a weird tasty crust which tastes like graham. Served in a chopping board is an assortment of cold cuts, bread and cheese. I’m not really familiar with the cold cuts but I guess that 2 of those are Prosciutto and Salami. Plus around 6 slices of brie, 9 cubes of gouda (not sure), the best marinated olives I’ve ever had and biscuits. L’Usine also serves Mariage Freres teas. I regret not ordering one. This is the view from our seat. I love the rustic beams in the ceiling. 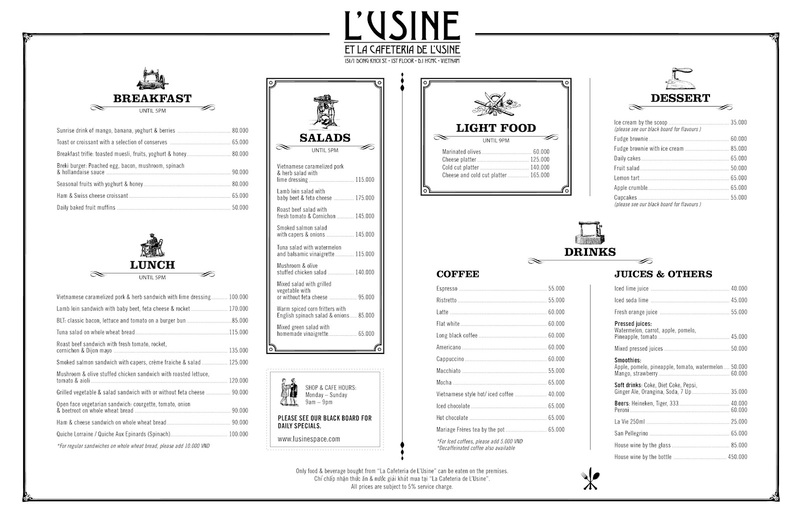 Here are additional pictures from L’Usine’swebsite. Cafe Area. From L'Usine's Website. Retail Space. From L'Usine's Website. I love L’Usine. It’s one of a kind. I went to 9 cafes in my whole Southeast Asian trip and L’Usine easily beats every one for the top spot. The food is expensive but the ambiance, the atmosphere and the quality is worth it. I’ll definitely come back here if I ever get to visit Ho Chi Minh City again in the future. L’Usine is located on the 2nd floor of the building across Saigon Opera House and Sheraton Saigon Hotel. Go through the Art Arcade retail store. Go straight inside then turn right on the first hallway and you’ll see the (steep) stairs going up to the café.